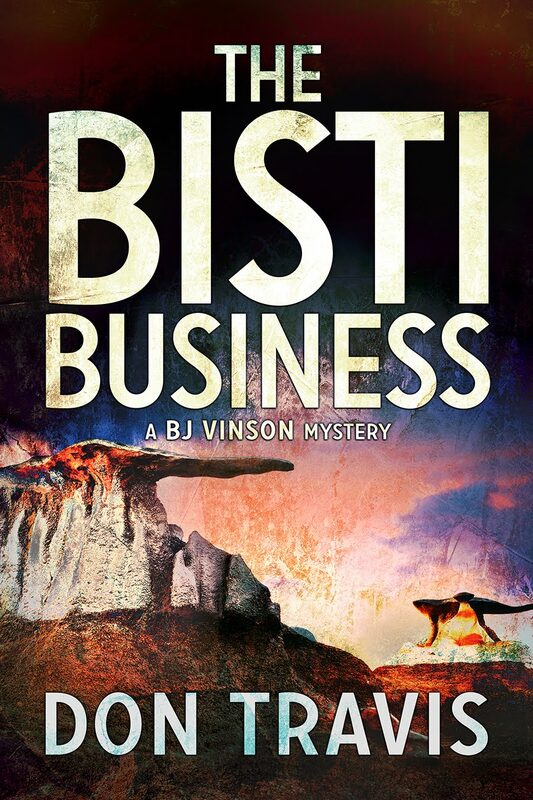 A discussion in my Bear Canyon Writing Class last Monday diverted my intent to write about something in THE BISTI BUSINESS (Martin Brown Publishers) highlighting points of interest in New Mexico. We were reading a piece that mentioned a Sun Dog (also spelled Sundog). That was when I learned my wise old grandfather had mislead me about these critters way…way…back when I was a child. All these years, a Sun Dog to me has been a bright ring around the sun, sometime with some color to it, but sometimes not. 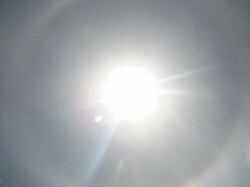 Someone else described it as a rainbow ring around a very watery appearing sun. But most of the class considered a Sun Dog to occur when two suns appeared side-by-side (one being the actual sun; the other, the dog). I was challenged by the class to look up the phenomenon. So I did. It seems that all three versions have some elements of truth. First, my grandfather’s version. The Huffington Post Science section posted a piece on the most common event of this nature called a 22Áo halo…or, more commonly the 22 Degree halo. Ergo, a SUN HALO. Citing the US Department of the Interior, they term this a type of Sun Dog. Next, the watery appearing or shimmery sun with a ring around it. Finally, what appears to be the more commonly held understanding of a SUN DOG, a double (but it can be a triple) image of the sun appearing at approximately 22 degrees of separation on either side of the sun (or on both sides in the case of a triple) when the proper kind of ice crystals are present and aligned properly to refract the light. These parhelion form at the lowest solar altitudes, but as the sun climbs in the sky, the sun dogs slowly move away from the 22 degree separation, although the remain on a parallel with the sun. At a 45 degree altitude, the sun dogs are fainter. They vanish altogether above 61 degree solar altitude. 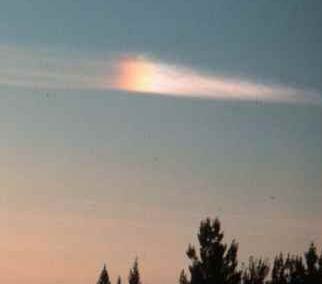 Over two millennia ago, the Greeks believed haloes and sun dogs foretold rain. Today scientists believe this is often a valid prediction because of the presence of ice crystals that form the cirrus clouds, which often precede a warm front. The Greek didactic poet, Aratus (ca 315-240 BC) mentions parhelia as a part of his catalogue of Weather Signs, claiming they can indicate rain or warn of approaching storms. 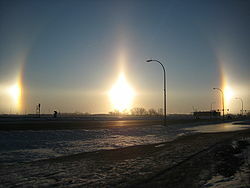 The Roman philosopher Cicero referred to sun dogs and similar events in his Republic (54-51 BC). Seneca, the Roman Stoic, speaks of them in the first book of his Naturales Quaestiones. Sun dogs are said to have had an effect on England’s War of the Roses. Three such suns appeared before the Battle of Mortimer’s Cross in Herefordshire, England in 1461. The future King Edward IV supposedly convinced his frightened troops that this represented the Holy Trinity. Edward’s troops won a decisive victory. 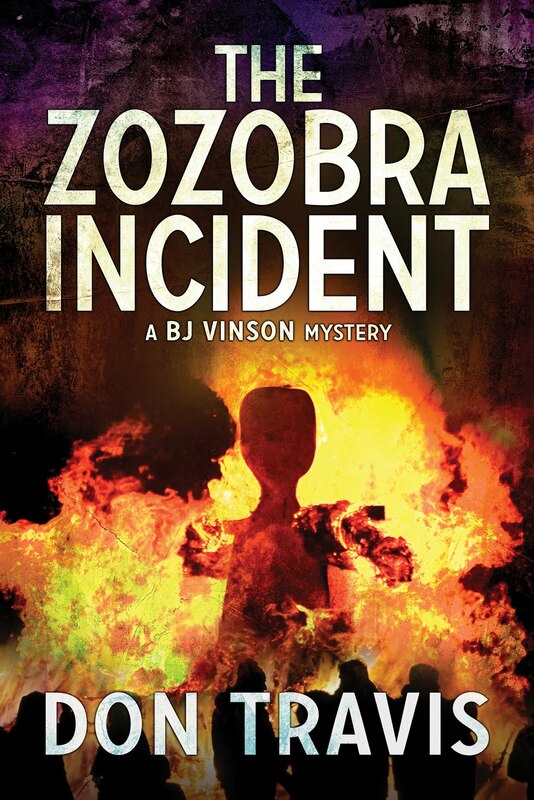 The depiction of this event appears in William’s Shakespeare’s King Henry VI. A set of powerful parhelia in Rome in the summer of 1624 caused René Descartes to interrupt his metaphysical studies and led to his work of natural philosophy called The World. There it is: more than you ever wanted to know about Sun Dogs…and a partial vindication of my grandfather. 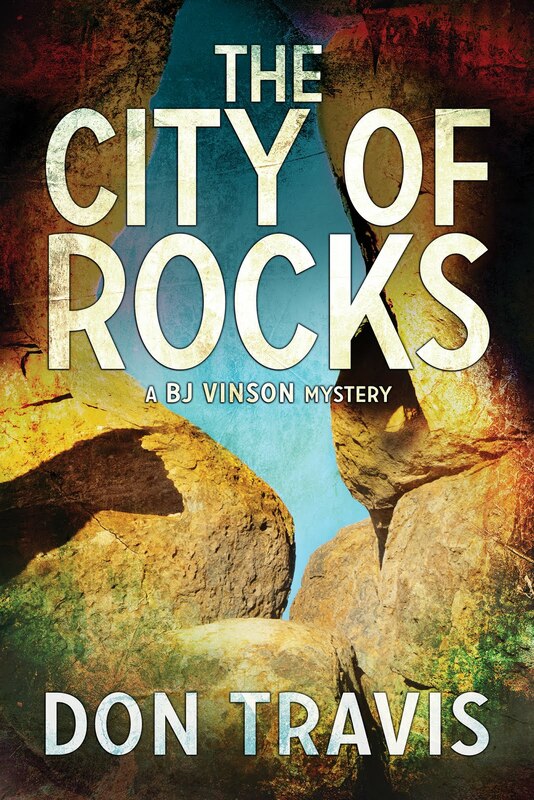 Next week: Will we ever get to the Bisti/De-Na-Zin Wilderness?